Please note, many of these tools offer free versions as well, but for full functionality you’ll want to go for the paid versions. For more detailed information about features and pricing, be sure to follow the links to the company websites. The Majestic SEO toolkit (@MajesticSEO) is a backlink checker and site explorer. They offer pricing plans at the silver, gold, and platinum level based on your needs and the size of your agency. 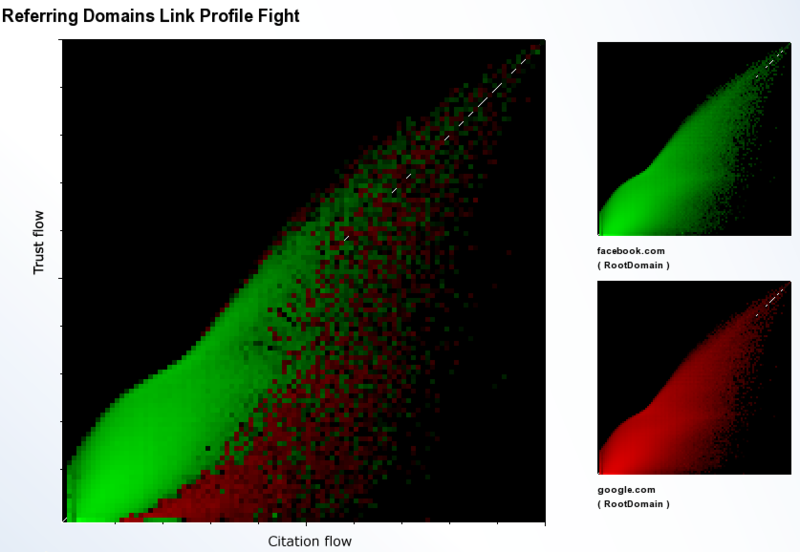 Whatever package you opt for, you will have access to detailed reports about a website’s citation flow, keywords, anchor text, and backlink history (you can even compare backlinks for up to five domains simultaneously). Majestic SEO also offers Webmaster Tools that you can link with a Google Webmaster Tools account. A particularly neat tool is the Link Profile Fight, which will compare the backlink profiles of two sites and map them graphically. It’s a cool way to see how your client’s site compares with a competitor. SEOmoz (@SEOmoz) is one of the most recognized names in the SEO world. In my last post, I mentioned SEOmoz’s Open Site Explorer as a great way to find backlinks. That’s only one of many tools that SEOmoz offers, which you can gain full access to by signing up for an SEOmoz PRO Account. SEOmoz PRO gives you access to an entire software suite on one easy-to-use platform. The various tools it offers allow you to track rankings, analyze your social media followers, check and compare backlinks across multiple URLS, test a website for crawl errors, perform keyword analysis, and more. A neat tool that SEOmoz PRO recently released is the Fresh Web Explorer. Fresh Web Explorer is an application that crawls feeds across the web for brand mentions. Any time a given brand or topic is mentioned on a blog, news site, or forum, you will be notified and provided with the link. You can track this information over time to get a picture of your brand’s popularity. The Feed Authority metric ranks feeds in a similar manner as Page Authority ranks webpages. It’s great for determining which feed mentions are most valuable for SEO purposes. Fresh Web Explorer allows the use of operators to customize your search. And the data can be exported to CSV format for convenience. “Fresh Web Explorer is all about finding the links and brand mentions (or really, any word or phrase) that the web has been talking about. FWE crawls blogs, news sites, forums, and anything with a feed to discover the content that’s talking about what you’re seeking. Raven Tools (@RavenTools) is the tool on this list that I’m most familiar with. What I like about Raven Tools is that it draws data from multiple sources (including Majestic SEO, SEMoz, Google Analytics, Google Webmaster Tools, and Google Adwords) in order to provide a comprehensive report. Raven has 30+ tools that can help you with almost any aspect of SEO and digital marketing, including SEO research, campaign management, link building, competitor analysis, social media monitoring, backlink reporting, content management, and metrics. The Raven Tools membership is reasonably priced. For the best experience, you’ll want to opt for the Agency account over the Pro account, which will allow you to manage more data and gather more reports per month. There are way too many tools to mention, but one of the most useful ones is the Research Tool. Here you can type in a competitor’s domain or keyword in order to generate an extensive report. The report provides you with a bunch of valuable information, including site metrics, average position data from Google Webmaster Tools, and domain link distribution. All this data is invaluable for determining where you or your client stands relative to the competition. I think it’s important to remember that Raven Tools was originally built by an SEO agency for other SEO agencies. As online marketing has evolved, so has Raven. 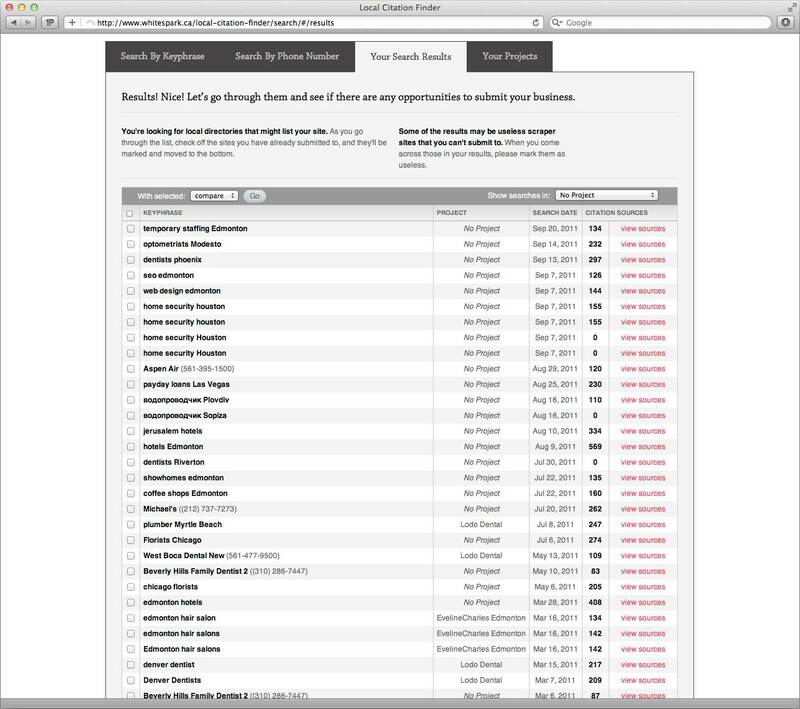 We now offer far more tools like Site Auditor, Backlink Explorer, and Research Central for SEO tasks. We’ve got tools for Social Media, PPC, content — and lots and lots and lots of data integrations from sources like Google Webmaster Tools, Majestic SEO and 20 others. Jeremy also invites you to connect with Raven Tools on Google+. Advanced Web Ranking (@awebranking) is one of the most sophisticated SEO software packages available. It provides tools that will help you with rank tracking, link building analytics, social media monitoring, keyword research, competitor analysis, and website optimization. It is particularly valuable for seeing exactly where a website ranks for a specific keyword on a specific search engine, as compared with competitors. With Advanced Web Ranking, there are no limits to the number of keywords, websites or search engines you can run reports on, and the data can be exported in multiple formats including HTML, PDF, XLS, XML, TXT, and CSV. You can also set up automatic report generation and dispatch to deliver reports to your clients automatically. You can customize your reports down to the city level and even search for keywords in other languages such as Hebrew, Japanese, and Chinese. Advanced Web Ranking can be synchronized with multiple Google Analytics accounts to see all your traffic information in one place. It can also be synchronized with multiple Facebook and Twitter accounts for social media data. Like other SEO software packages, Advanced Web Ranking offers multiple pricing plans ranging from Standard, to Professional, to Enterprise, to Server. With the Server plan, you gain the ability to streamline your workflow across multiple staff members connected to the same client database. SEMrush (@SEMrush) is a competitor research tool that focuses on all aspects of search engine marketing, including SEO and paid search advertising. SEMrush has access to a massive amount of data from both Google and Bing, which allows you to see where competitors are ranking for over 95 million organic keywords. You can determine exactly how successful a given keyword is for a particular domain, and see the value of organic traffic to specific landing pages. One of the major benefits of SEMrush is that it doesn’t just aggregate data from secondary sources but gets it straight from Google and Bing, tracking each keyword separately in its database. The data is refreshed on a regular basis so you can be confident in its accuracy. Using SEM charts, you can the search engine traffic for up to five domains. Beyond strict SEO, you can also compare metrics for number of paid ads, ads traffic, and ads traffic price. Armed with all this information, you’ll be in a good position to know where you need to focus your SEO efforts in order to compete. 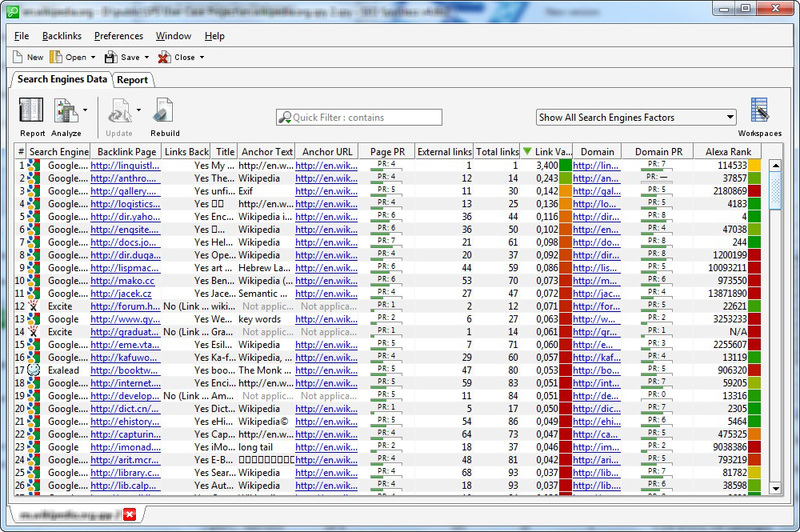 WordTracker (@wordtracker) is most known for its keyword research tool. The Keywords tool draws on data for over 160 million keywords, in addition to the 95 million keywords powered by Wordtracker’s partners at SEMrush. With such a massive amount of data, finding appropriate short and long tail keywords is a cinch. WordTracker provides you with up to 1000 keywords from a single seed. It also shows competition data on how many pages are competing for each keyword and what it’s potential value is. 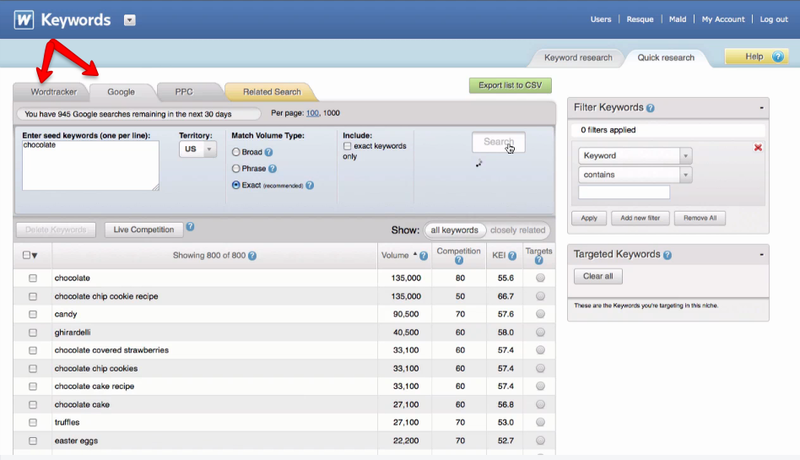 The Related Keywords tool helps you broaden your search by suggesting related topics and niches. WordTracker recently released a Link Builder tool as well. The Link Builder scours the web to find your best link prospects based on authority, popularity, and relevance. Link Builder allows you to see who’s already linking to your web pages and your competitor’s web pages, target specific sectors, and save the best links into individual campaigns. It automatically removes links that don’t help you, such as no-follow links, image links, and redirects, so you don’t have to waste your time. Quality inbound links are worth a lot when it comes to search engine rankings, so being able to sift through the noise and find the ones that matter is invaluable. I created an early form of the Keywords tool in 1998 with my brother as a result of some other work we were doing researching magic you show your friends in pubs and bars – we realized that there was a huge amount of insight available to marketers and entrepreneurs in the searches that people were doing on the Internet, and we initially started emailing lists of keywords that had been used by searchers to our very early customers. In a short space of time, we built and released version one – the very first Wordtracker keyword tool – and it quickly became the industry standard. Since then, thousands and thousands of web advertisers, site owners and web entrepreneurs have used our keywords tools – from the newbies starting up to some of the most prominent and successful marketers on the scene. One of the best uses for the tool is being able to find the actual language that your potential customers are using to try to find your products. There’s no point optimizing your site for ‘intumescent paint’ when most people are going to be looking for ‘fireproof paint’ (it’s the same stuff…). Our Keywords tool is also a great resource for brainstorming keyword ideas, as well as helping to establish how much competition is out there for each keyword – so you can make really clear decisions about which keywords are likely to give you the most traction in your marketplace. SEO PowerSuite (@LinkAssistant) is an all-in-one SEO software package that combines rank tracking, site auditing, and link building functions. The Suite is made up of four software tools that you can also choose to purchase separately: Rank Tracker, WebSite Auditor, LinkAssistant, and SEO SpyGlass. Rank Tracker instantly checks where your website ranks for all your keywords, and helps you discover new keywords to target. It supports 341 international and local search engines and uses a “number-of-searches-to-competition” ration to show you the best keywords to optimize for. Best of all, Rank Tracker lets you work with an unlimited number of domains and can be completely automated. WebSite Auditor allows you to analyze an entire site on both a micro and macro level for common errors such as broken links, duplicate content, and missing HTML elements. The tool will recommend specific steps to optimize your website for specific keywords on specific search engines, and show you how your website compares to the top-ranked competitors. LinkAssistant makes the link-building process simpler by finding valuable link partners along with their contact information. The tool also allows you to create and upload your own link directory, manage email correspondence with link prospects, and monitor your links over time. SEO SpyGlass reveals the entire link-building strategy of competitors’ websites, including the number and origin of backlinks, their Google PageRank and Alexa Traffic Rank, and their anchor and title keyword density. Knowing what the competition is doing is a great way to stay ahead of the game. The SEO PowerSuite is constantly being updated free of charge, with a new edition released roughly every two or three months. The paid version of the software is available at both the Professional and Enterprise level depending on your needs. “We started SEO PowerSuite in 2005 with just one tool – LinkAssistant. Today the toolkit also includes Rank Tracker, SEO SpyGlass and WebSite Auditor, and we’re recently introduced a new product for social media management – BuzzBundle. One of the most popular tools in the bundle is Rank Tracker. Over the years, its functionality has grown far beyond keyword research and rank tracking. 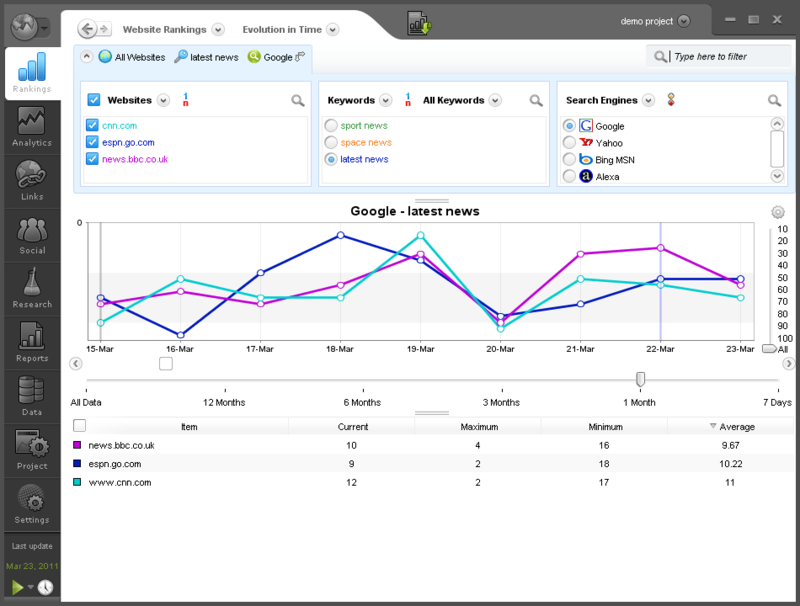 For instance, it is integrated with Google Analytics to let users see if their high rankings result in traffic gains. 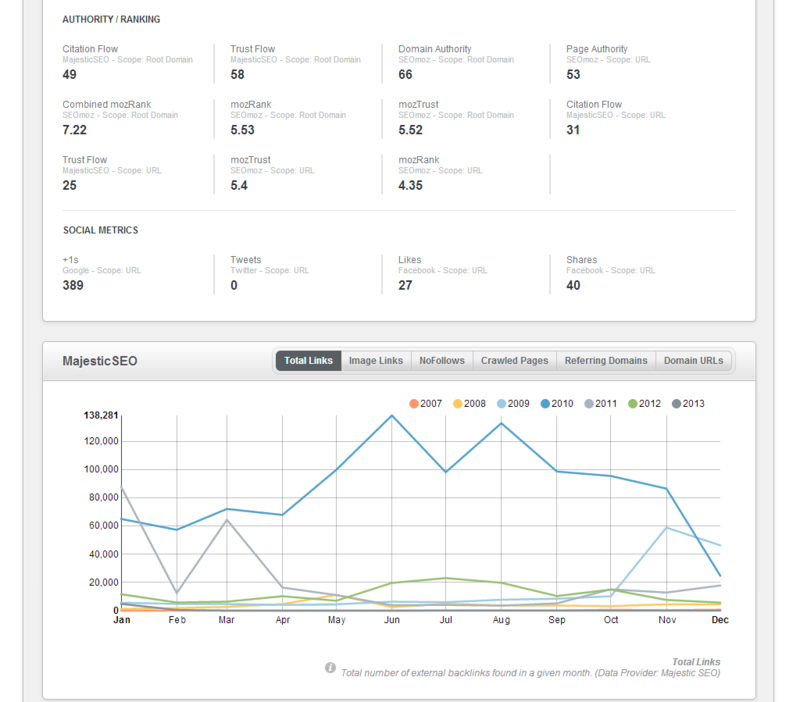 In April 2013, we’re launching landing pages optimization and PPC monitoring into Rank Tracker. To stay current, simply follow us on our SEO blog and in social media: Twitter, Facebook, LinkedIn, Google+. Ahrefs (@ahrefs) is a suite of tools that uses their own index of live links to provide valuable SEO data. 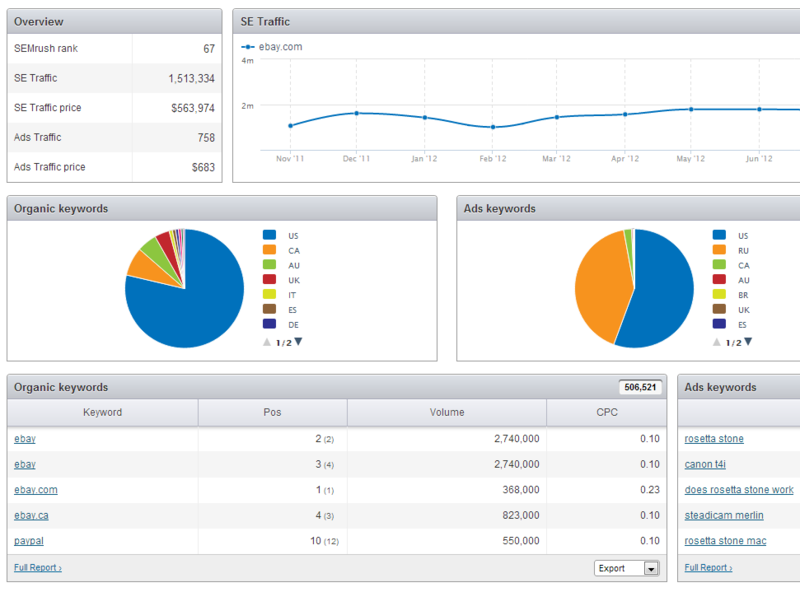 The suite includes a Site Explorer, SEO Report, Backlinks Report, Domain Comparison, and Batch Analysis. The Ahrefs tool it’s probably most known for is the Site Explorer, which is a backlink checker similar to Majestic SEO and SEOMoz’s Open Site Explorer. 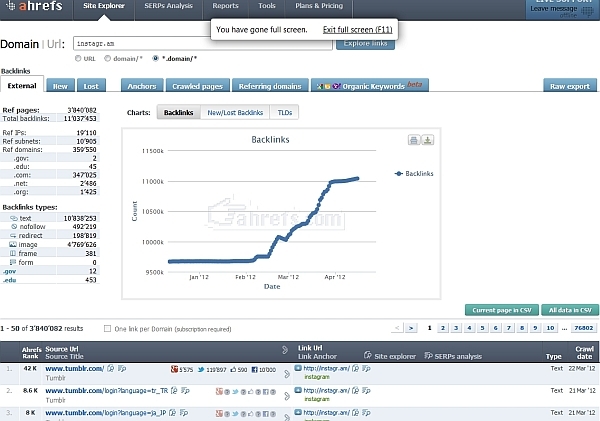 Site Explorer runs reports on a domain or URL and returns information about the number of backlinks, backlink type, referring pages/IPs/subnets/domains, and anchor phrases. Its live links update every fifteen minutes on average. 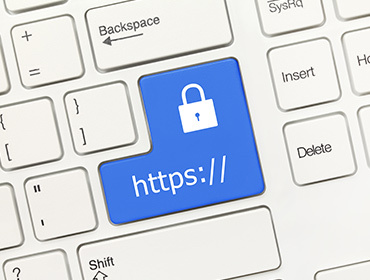 Clicking on the Backlinks tab provides more detailed information about your backlinks, including the Ahrefs Rank (similar to Google Page Rank) and Alexa Rank, as well as the number of likes, shares, and retweets on social media. Another neat feature is Batch Analysis, which lets you run reports on several domains/URLs at the same time with the option to export in CSV. “At some point, we noted that the instruments already existing in the market were slow to analyze links, collect data and not always easy to use. In addition, it did not look like that was going to get improved anytime soon. This was an ideal situation to capture the market. We focused on the product and now, after 2 years, our service is used by over 160,000 people. BuzzStream (@buzzstream) is a great tool for link-building, CRM, and social media management. With BuzzStream, you can easily bookmark websites, search pages for contact info, collect metrics, track Twitter conversations, segment contacts into email lists, and more. Let’s say you’re working with a client who sells health and beauty products. You can use Buzzstream to search for websites related to that vertical, and Buzzmark them into your link-prospect database. The tool automatically provides the relevant metrics and searches the site for contact information, forms, and social media profile information. You now have all the information you need to reach out and start link-building. We designed BuzzStream to remove the time-sucking parts of link building – like gathering metrics, researching contact information, and managing spreadsheets – so outreach professionals could focus on creating relationships and doing real marketing. While BuzzStream can be used for lots of outreach-based link building tasks (including guest posting, broken link building, and link removals), our favourite way to use it is content creation and promotion. Once you’ve brainstormed some ideas for great content, find some influencers who might be interested. (You can use aggregators like AllTop, prospecting queries, or tools like FollowerWonk to find influential publishers and bloggers on any given topic.) Reach out to them, get their feedback on your idea, and include their feedback as you develop your concepts. Then, create your content, and let both your core influencer group and the web at large know about it. 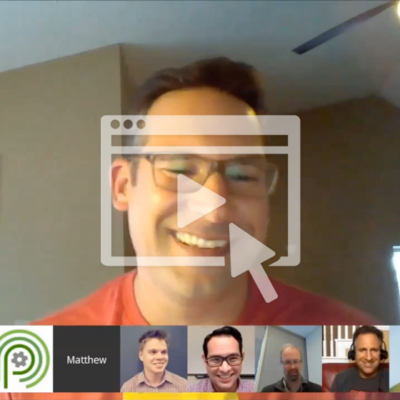 Whitespark (@whitespark) is a Canadian company that offers a suite of SEO tools, including the Link Prospector, Rank Tracker, Review Handout Generator, Offline Conversion Tracker, and Local Citation Finder. Perhaps the most unique of these tools is the Local Citation Finder, since it focuses on a specific area of SEO that doesn’t get as much attention as others – local SEO. Local SEO is all about getting a business to rank in the local results section of a Google results page, which can be critical for a business’s success. Local Citation Finder allows you to discover citation sources (a critical factor in local search rankings) for particular keywords in particular cities. With this information, you can easily build citations for your client on the websites that are the most relevant and authoritative. The Citation Finder also allows you to search for citations by phone number, so you can quickly find a record of your client’s current citations or spy on a competitor’s citations. For more information on this tool, check out my colleague Michael Smith’s ultimate guide to Whitespark’s Local Citation Finder. There’s no shortage of SEO tools available online. To find the ones that work best for you, be sure to shop around, sign up for some free trials, and compare. That’s my list. Now it’s your turn. Are there any other great paid SEO tools out there that I missed? Let me know in the comments!